TII - American Transport, Inc. The TII Companies are always seeking experienced, safe and professional fleet owners, owner-operators and agents. Click here to see detailed information on hundreds of available loads - everyone is welcome! Contractors enjoy discounts on fuel, tires & hotels. Come inside and check them out! Welcome to American Transport, Inc.
At the present time, American Transport has a fleet of approximately 210 active units and approximately 65 terminals. American Transport, Inc. ("ATI") commenced operations on January 1, 1986. Licensed by the Federal Highway Administration, ATI transports general commodities in the continental United States, Alaska and all of the Canadian provinces. ATI was formed by the management team that operated the Special Commodities Division of Carolina Freight Carriers Corporation from 1976 to 1985. Many members of that team continue to be active in the day-to-day operation of ATI. The company was acquired by Transport Investments, Inc. on January 1, 1989 and represents its largest holding in terms of revenue. ATI has been an acquisition platform for companies not meeting TII's stand-alone investment criteria. ATI specializes in the movement of truckload and less-than-truckload shipments, primarily by flatbed, step-deck and specialized equipment. We serve a variety of customers from the Fortune 500 to smaller manufacturers and resellers. Major commodities transported include: steel, lumber and building products, machinery & equipment, and minerals and sand for the oil and gas drilling industry. 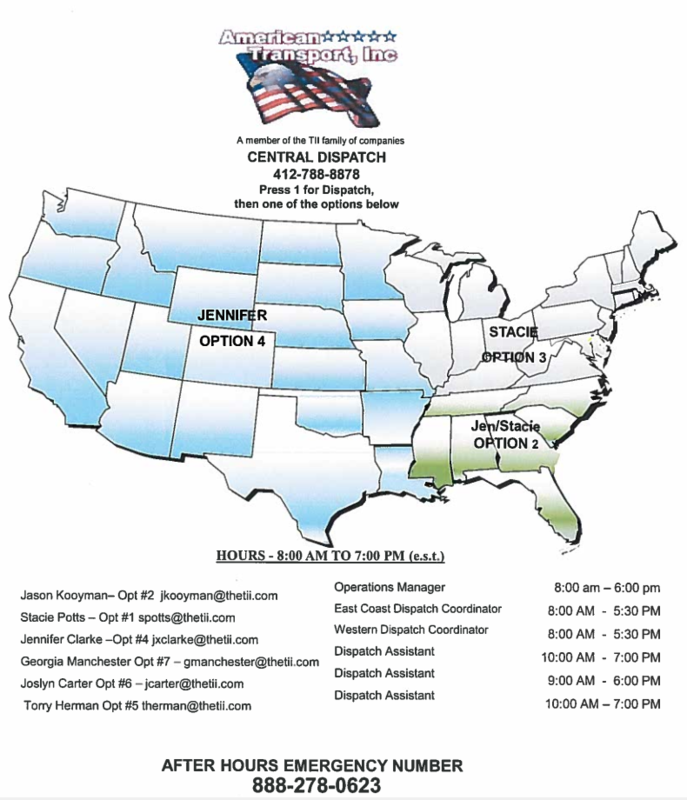 American Transport, Inc. operates with a Central Dispatch, as well as an in-house Sales Department. We also have a terminal network throughout the United States and Canada, as well as a number of Divisions that specialize in certain geographic areas or types of freight.